As a prelude to this year’s Sydney International Boat Show of 2011, the Sydney area has experienced the wettest and windiest July in 60 years, according to the locals. As I sit here on the plane with a 44 hour transit in front of me (I must have a word or two with my travel agent when I return) back to the states, it gives me time to reflect on the show. Knowing well how good or bad weather plays into the success of any boat show, you can imagine my angst when Andrew Coffey, Outer Reef's general Manager of Australia and New Zealand gave me daily weather updates as the show approached. From the delivery and offload of our newest model, the 63 open Motoryacht, which had been delayed due to horrendous weather en-route from Taiwan to Australia, to the delay of the move into the show due to 5-6 meter seas and wind to 60 knots around the Sydney area, all was not looking good for the start of one of the two major boat shows of the year in Australia. It is winter in the Southern hemisphere and typical weather is windy, overcast, rainy, around 40-50 degrees during the day, and temperatures can go down as low as freezing or below at night. Perfect boat show weather! As I crossed the Southern oceans at 36,000 feet headed to OZ, I was bounced around by the storms brewing above and below. As we closed in on Sydney 2 days prior to show time, and while on approach, the pilot came on the intercom and announced that we were ahead of schedule (must have been those bumpy tail winds) and the forecast for Sydney (for at least that day) was to be sunny and mild. The talk of the town was all about the weather. The forecast for the next week was for sun and temperatures into the 70's. Needless to say I was greatly relieved. The winds had calmed down to a light breeze and all the boats moved into the show, albeit a bit delayed. It was like Poseidon, the God of the Seven Seas had laid down his Trident and given us a reprieve from his wrath of the past month. It made me think a bit that Poseidon may have been an Aussie rather than a Greek. Show day opened with not a cloud in the sky, with just a whisk of wind and temperatures approaching 75 degrees. The crowds were strong and the quality of the crowds was even stronger. 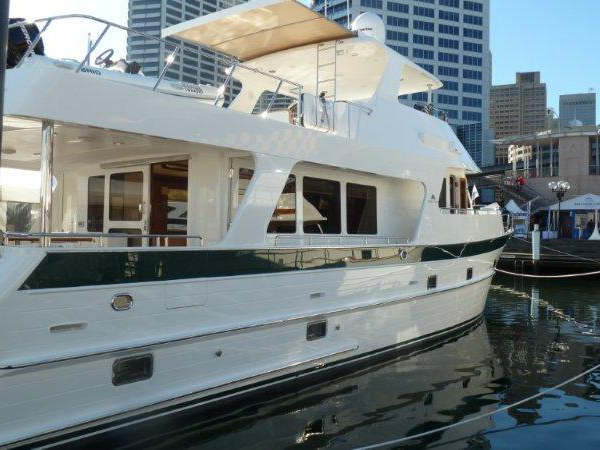 Outer Reef was displaying its newest model - the 63 open pilothouse Motoryacht. This new model is a modification of our 63 cockpit model whereas we removed the cockpit and re-allocated this space creating a larger boat deck, aft deck and salon. This boat in particular, built for an Australian client and his family also boasted a crew quarters aft with full head and shower as well as a very workable utility space. 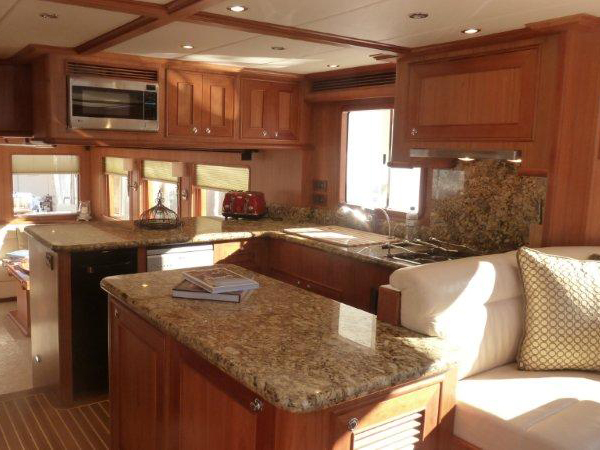 The interior layout on the main deck is an arrangement that is open between the pilothouse and the galley, as well as the rest of the main deck. It was a smashing success. The crowds overwhelmingly resounded it as a magnificent layout and best in her class! We saw many people from shows of previous years that seem finally ready to commit to purchasing and Outer Reef. Although not the overriding issue, the strength of the Aussie dollar has garnered some influence in their decision making. During the show the Aussie dollar was at $1.10 to the US dollar! To give some perspective on this, when Outer Reef opened its office in Sydney 4 years ago, the Aussie dollar was $.67 to the US dollar. The current strength of the Aussie dollar, as well as the Euro and Canadian dollar is definitely influencing the purchasers of Outer Reef's which are sold in US dollars worldwide. There is no better time than now to purchase a new Outer Reef, especially if you are Australian, European or Canadian. The remainder of the show was no different in terms of weather and strong crowds. We even had numerous sightings of the elusive "Monday be-back" (I'll be back), those taking a final look and walk through and taking advantage of the lighter Monday crowds to get down to the serious business of negotiations. This is something that has been non-existent over the last few years. I had almost begun to think that the "Monday be-back" had gone extinct, lost forever, a casualty of the even more elusive global warming! All now is good in the world Mr. Gore! 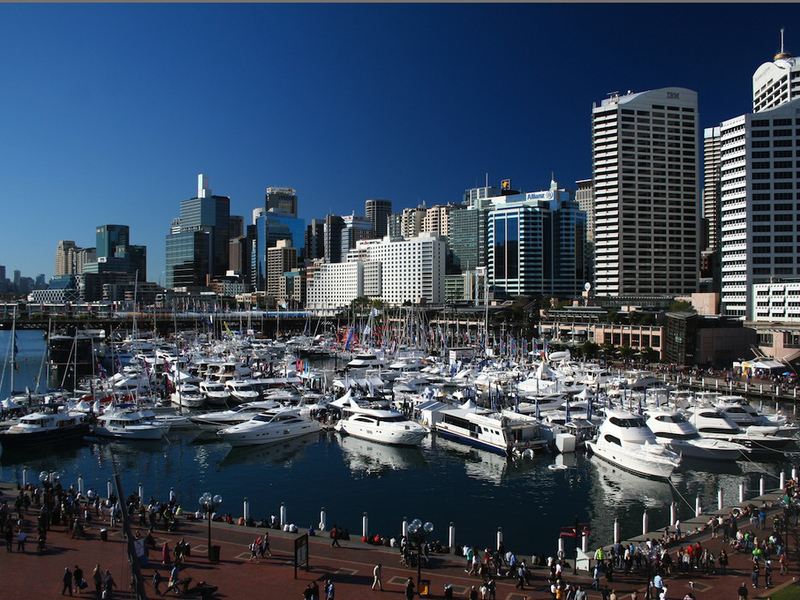 I came away from this year’s Sydney boat show with great optimism, more so than any boat show in the past 4-5 years. I feel very confident that we will close some new build contracts, with a half dozen contracts currently being negotiated. Obviously there are some specific economic parameters at play in OZ, but I think this is commensurate with the continued rise in optimism that is returning to the boating industry worldwide. I want to extend a very special thanks to our team down under for a very well organized show (as always). Thank you Andrew, Justin, Daniella, Matt & Kenny. Also an extra special thanks to the Beattie Family - Mark, Claire, Amy and Emma, the new owners of "WONYIP III", our Sydney show boat. The Beattie's will be leaving Sydney with "WONYIP III" in the next week or so heading to Melbourne in the Southern oceans where she will be home based. 43 hours now and counting and I will be back in the States and will begin the work to finalize some of these contracts. After that? Of course yet another boat show, oh and yes, not to forget about that travel agent!